Thank you to AussieGambler for donating 500 credits to Habbox. Thanks to pozei12 for donating 50 credits to events. A huge thank you to Rayxol & Bkps who have both donated various furni items to the Events Department. A big thank you to Jesse,123 for donating 300 credits to the Competitions Department! A huge thanks goes to MissAlice for donating 300 credits towards Habbox. Thank you to @HE-Joshua; for donating 55 Credits to Habbox! Thanks very much to @HE-Joshua; as he just donated 50 Coins to Habbox Events! The day I get to 200 in Ping Pong II is the day my life is complete. Another thank you to @HE-Joshua; for donating 50 Credits to the Competitions Department! Thank you to @HE-Joshua; for donating 50 Credits to the Help Desk . Big thank you to !EOD! 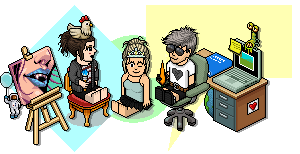 for donating various items of furniture to Habbox!